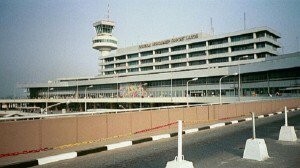 There was pandemonium at the General Aviation Terminal of the Murtala Muhammed Airport, Ikeja, in Lagos as a gun allegedly belonging to a security personnel went off ‘ac­cidentally’ and injured three persons. The injured were those allegedly standing close to the gun-carrying security personnel. Saturday Sun re­ports that there was no loss of life. It was learnt that the security offi­cer, an orderly to a serving Senator, who was either trying to buy an air ticket or check into a flight had not put the gun on safety catch, hence the explosion. Those injured were rushed to hospital within the airport, where they are receiving treatment. Those who heard the sound of the gun thought it was a terrorist attack and fled for safety, but the fear was later put to rest when it was discov­ered that it was gunshot not inten­tionally fired. Regulatory agencies at the airports usually demand that members of the Police force, the mil­itary or secret service officials bear­ing arms surrender such fire-arms to relevant airport security officers once they are inside an airport termi­nal building or prior to boarding an aircraft. This incident it was learnt however happened at the ticketing section of Arik Air. The General Manager, Public Affairs of FAAN, Mr. Yakubu Dati, who confirmed the incident, said what happened was an accident and added that stowing the gun away with its magazine was a standard procedure because guns are not taken on-board an aircraft, but are usually checked in in the luggage compartment.